When I was young, I was a little different than the other kids. I suffered from Juvenile Rheumatoid Arthritis that was diagnosed at the age of five. Because of the growth variables and bone and joint weakness caused by this disease, from age five to eight, my activities were seriously curtailed. To this day I distinctly remember the doctor say that I needed to rest, and not get involved in any strenuous activity or sports in order to ensure a somewhat “normal future”. That line stuck with me. With that said, my dreams as a young man are what really made me different. My dreams were simply to walk without pain. For me walking more than ten or twenty feet was a triumph at times. While most kids my age dreamed of professional sports or vacations in the Caribbean, I dreamed of walking – long hikes through the woods at home, backpacking through Europe, seeing the lands of my ancestors in Germany and Poland, and walking the same beautiful hills that the Von Trapp Family did in “The Sound of Music”. That’s what I dreamed of. Never did I dream that one day I would become the best of friends with a man who himself lives near those hills in Austria. But I would meet such a kind man; a man that by the way, has incredible skills in craftsmanship as a pipe carver. That man is Thomas Bazant. I was trying to remember the first time that I spoke to Thomas, and had to go back and re-read my Facebook messages to find it. In April of 2012 I was introduced to Thomas and his work through my good friend and pipe artisan Kurt Huhn whose product we have already reviewed HERE, and HERE. 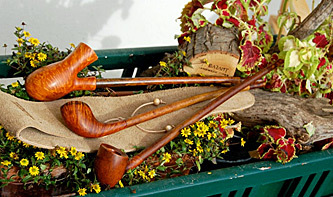 The first image of Bazant pipes was the collection you see in this image. I was awestruck by these pipes. What popped to me was the finish. It seemed soft and inviting to the eye. The staining was robust, different, seemed totally natural, ‘organic’ may be the word to use, and really jumped out at me. The colors were earthy and warm. The stains had definitive hues to them, each of them daring and bold, and yet attractively opaque. It gave these pipes an over-all finish that intimates the impression that you could walk right through the stain into the grains of the briar itself, and crawl around those veins as though they were the peaks and valleys of the Austrian Alps themselves. This was a different look than what I or most pipers quite frankly are used to, and I loved it. So, impressed and almost giddy by what I had seen thus far, I contacted Thomas almost immediately to open communications. My first inquiries with Thomas outside of the normal pleasantries were to take a look into his history as a pipe maker. To my surprise, Thomas Bazant had not been marketing his work for very long. 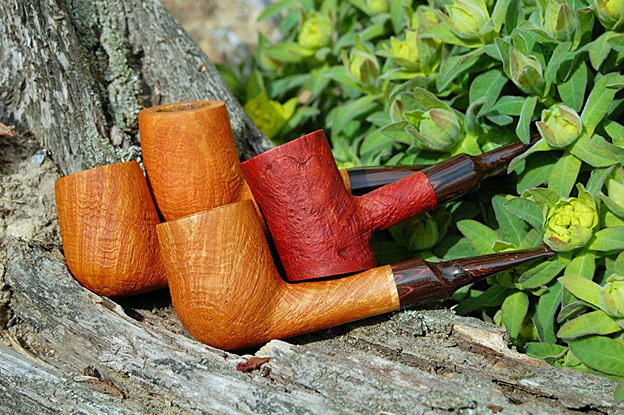 While certainly not new to pipe crafting, Thomas spent all his early efforts in pipecrafting in making pipes for himself and his friends. Fairly new into the pipe making scene, he soon discovered what a humble man with drive, raw talent, quality tools, a dream, and good social networking skills could do. Thomas was about to burst onto the pipe making industry with a resounding boom. What I quickly came to know of Thomas is that he is an avid collector. His joy in pipes goes back a very long way. 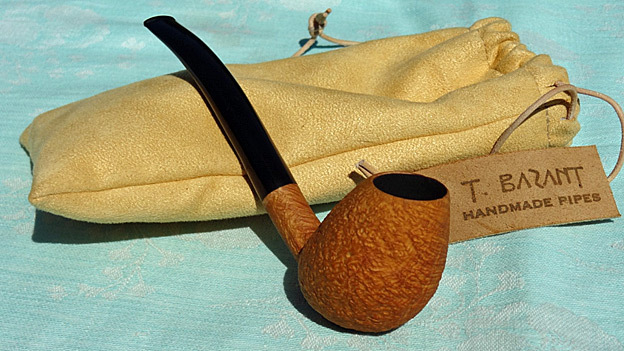 One of my bucket-list pipes had been a really nice original Stanwell 11 model. As we got to talk it, it turns out that Thomas has an affinity for them as well. But his collection of 11’s is a little low right now – he only had about 50 of them! Collecting and smoking eventually became restoring, then carving and creating pipes for himself. This, along with a little nudge from his good friend and fellow Austrian Klaus Zenz, Thomas was soon carving for others. The notoriety and demand of the pipes being made by Thomas had grown so fast that it quickly reached a zenith where it became so much work and demand on his time, that he began to lose the fun of pipe carving. Making pipes is simply a passion for Thomas. This has always been the focal point of his involvement in the industry. His passion for pipe carving, collecting and smoking are important to him. They are part of what makes Thomas who he is. But nothing is more important to him than his wife Gabi, family and friends. When balancing his passion for all things pipe related with the time he had left for his family affairs, Thomas made the decision to cut back on a full scale production business. And so began another new direction and focus for Thomas as he continued to hone his skills and creative processes. Currently doing exclusively commissions, and carving the pipes that are first created in his heart, Thomas can make sure those things that are most important (his health and his family), are getting the attention they need. Now he is on a track of his choosing, making some of the finest briar pipes anywhere- all the while living his passion. 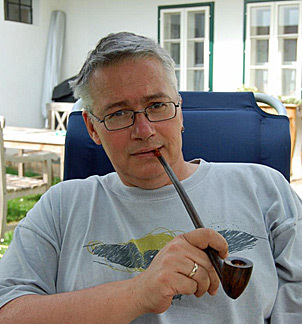 “…the classic Danish style of Nordh, (and) Ivarsson”, and perhaps his biggest influence and mentor Klaus Zenz. Once I had completely convinced Thomas that I was serious about wanting one of his pipes for my collection, he soon obliged. Using my purchase of a hand selected Stanwell 11 from his private collection as an excuse, Thomas enclosed this beautiful Breakfast Egg for me to enjoy and review. The pipe arrived packed very well. It was delivered in a handmade (by Thomas) pipe pouch/sock constructed of a micro-fiber leatherette material with a leather pull string for closure. The pull string secured a leather tag with the T. Bazant name and stylized logo (also hand made by Thomas). All-in-all, a great looking package. The name comes from the prototypical egg shape of the pipe, something we see with regularity in most modern carver’s repertoire. Egg, sure, but why the “Breakfast” tag? And he’s absolutely right. The grain ‘glows’ as if the sun is just beginning to peak out from behind the morning clouds. 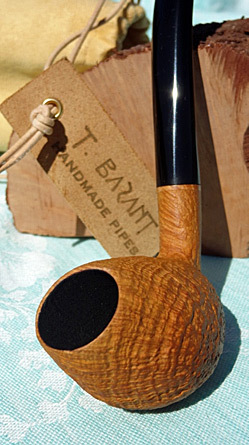 The Bazant style of blasting truly exposes the grain of this stummel as if it were an impressionist painting. Interpreting the grain as a scene in a Monet or Van Gogh is an easy thing to do, not asking much of a reach in artistic impression. It truly is a stunning feature now on display thanks to Thomas’ work. 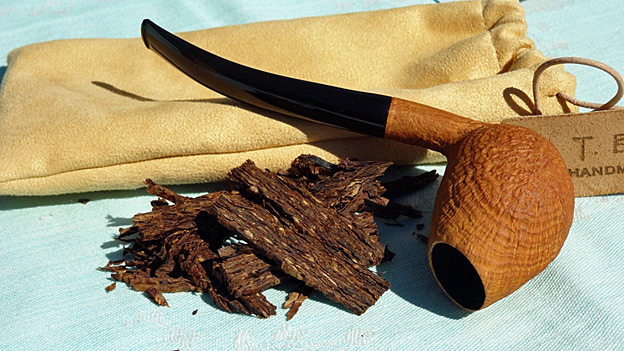 A morning pipe after the eggs and bacon sounds good to me. The Breakfast Egg presents itself as relaxing gentlemen’s pipe. Not for Black-tie events, but not something you want to take with you on the job either. The second it hit my hand, it invited me to sit and retire for the evening. The Egg is lightweight, coming in at just under 52 grams, or roughly 1.82 oz, just a hair over 6 inches lone over-all, and sports a 5/8″ bowl over an inch deep that allows for a grand smoke. At 2.8″ tall and 1.5″ wide at its portliest, it is comfortable to hold and easy to store and transport. 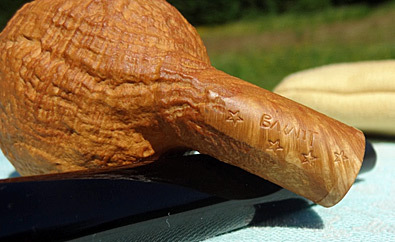 While Thomas does not currently grade his pipes, he does provide a unique and attractive star based cartouche that includes a stylized signature of “Bazant”. of quality briar stock, and a good read on each block. I know we already talked about the finish choices of Thomas’ pipes we have seen above. One factor I failed to bring out earlier is their low gloss finish. They have a ‘matte’ look to them, and while not reflectively brilliant, they are stunning. However, the low-gloss factor drives the eye to the sheen of the stems. Thomas loves to work with wood as well as acrylics for his stems, but this Breakfast Egg is classic German Ebonite and it shines like the sun. With such beauty to the stummel, this action brings a true balance to the pipe. That sunburst pulls you in, and then the glare from the German ebonite stem brings your eyes back to the other end of the pipe. I find myself traversing the contours back and forth over and over, and I just don’t get tired of it. The color of this pipe is one of Thomas’ favorite. Without revealing exactly how it is done, or exactly what shades or brands of stain he does use, he shared that the finished color of this Breakfast Egg is a combination of a yellow-orange-yellow and then brown layering that gives it that warm earthy tone. The stem itself, as stated, is classic German ebonite. The fit into the shank is tight but not overly so. While the ebonite does bear some of the inevitable tooling marks that expose themselves when placed under a high resolution camera, when these two pieces are slid together they form a strong bond that creates a finished product anyone would be proud of. The finish work at the stummel is done well, and the airflow is strong and consistent. It is finished as finely as any, and the bit contour is smooth and the opening wide to accommodate expansion before the smoke leaves the mouthpiece helping to cool the smoke. If there is any criticism or concern with regards to the Breakfast Egg, it comes from personal taste more than anything. I have gotten used to a wider bit and find that more comfortable to me personally. I’m sure this is not true for everyone, so this is certainly something that does not diminish the value of the pipe one bit. 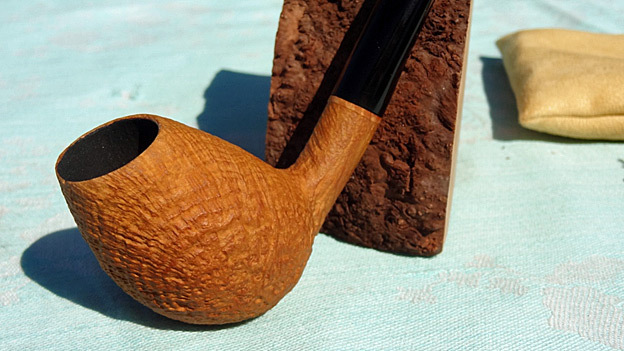 Based on the contour of the shank and stem, anything wider in the bit would seem obtrusive and would take away from the aesthetics of the pipe I’m sure. The stems smaller size is perfect for the Breakfast Egg, but I have found that the pipe is one that needs held in the hand more often than in the mouth for my personal comfort. For me, this is no problem as mentioned before, this is a pipe that calls one to sit and relax, grab a cup of tea and a book, and forget about the rest. I also have a concern with fragility. By the very nature of the design and shape, the rim of the bowl is thin. Unless I’m careless enough to drop it on the concrete or something however, I have not experienced this as being a problem. After 6 months of use the Egg has not been damaged, but it is something I’ll need to watch out for. Just something I have to keep in mind. I fell in love with this pipe the first time I saw it. To the reader, this may come across as a point that may cause me to lean my bias in favor of high marks of the pipe in this review. While I cannot fault the logic, I’d offer a counter point of view. When one gains an affinity for something before they actually take possession of it, it is easier to end up with severe disappointment in the product because your expectations have been set so high in anticipation. To be honest, I did have that concern. No one ever wants to be let down. I so loved the look of this pipe I had to consciously work not to prematurely anoint the Breakfast Egg to a weekly rotation of my 7 most coveted pipes. Also, I had to remember that while Thomas was making a serious splash in the social media network of the day, and was well on his way to earning a reputation among associates in the industry, the number of Facebook® friends one has is not necessarily indicative of the quality of their work – and I knew Thomas was still learning and growing. Disappointed I was not. 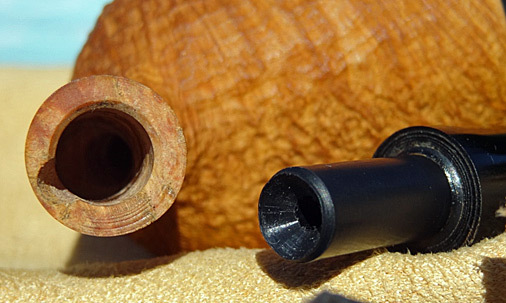 Thomas has a desire to produce pipes that reflect upon nature. He considers the briar to art in and of itself and does his best to accent that. This includes the interior of the bowls as well. That being said, Thomas prefers a natural bowl with no pre-carbonate coating. It allows for the revealing of even more of the pipes beauty and grain structure, especially for collectors who do little or no smoking. Coating bowls is therefore not a priority for Thomas. Exceptions are made in some cases where bowl dimensions are thinner, as the coating does add additional protection. In this example the Breakfast Egg is coated with his proprietary coating to protect the bowl and to promote cake formation, and protect the thinner areas of the bowl from excessive heat from early smokes. The coating is well applied and even, not nearly as thick or rough as I have seen in others. I’m not usually a fan of a bigger bowl, as I am a light smoker. But having relegated this pipe to my aromatics and one I use for evening relaxation, I do tend to fill this with more tobacco of my favorite blends then I do other pipes. The sheer volume of the bowl of course does not have to be used in full, but it is there for the occasion you wish to do so. I filled this Bazant Breakfast Egg to the three-quarters mark on two instances using a Cornel & Diehl blend called Autumn Evening and a Sutliff Private Stock Navigator Blend (an Altadis USA product) that I have found to burn at about equal rates in other pipes. Each allowed the Breakfast Egg to provide about 30-40 minutes of smoking time with several re-lights (I’m no slow smoke champ, that’s for sure). I have met quite a few people over the last couple of years as a journalist in this industry. Thomas has become one of my good friends. His spirit is always bright, he’s at all times seeing the good in events and people, and ultimately, nothing pleases him more than to know that the pipes he has created first in his soul, and then with his hands, are being used for what he sees as their intended purpose: to bring each user joy. This pipe smokes better all the time. While reviewing pipes, I cannot say that I have ever had any that I have hated. On the other hand, I don’t own them all anymore, and only a select few have made it into my regular circulation. Flat-out, his pipe is a keeper. I enjoy it immensely and it grows on me more and more as I use it. I have already asked Thomas for a couple other pipes from his collection. Funny thing is, he’s human too, and has some of his own personal favorites that are simply not for sale. I can sense a commission coming on! I can highly recommend Thomas’ work. With a variety of influences, to his creations that are at times recognizable (as they should be), the range of skills allow him to create pipes that are only limited by his, and your, imagination. Driven by his heart and his love for pipes, his goal is spread the joy of ‘piping’ to all who care to participate.